As an aspiring barrister, I really enjoyed the opportunity to speak and present my case in a mock courtroom. "When I first started at Nottingham Trent University (NTU), I was anxious about whether or not I would make friends, especially when I was living at home. Despite this fear, I was welcomed with open arms by NTU throughout the Welcome Week. The Students' Union invest a lot to ensure you feel at home. "During my time at the University, my favourite modules have been: EU Law, Criminal Law and Human Rights Law. The passion of the lecturers and tutors really makes seminars more enjoyable and engaging, and has inspired me to research further into the subject areas. 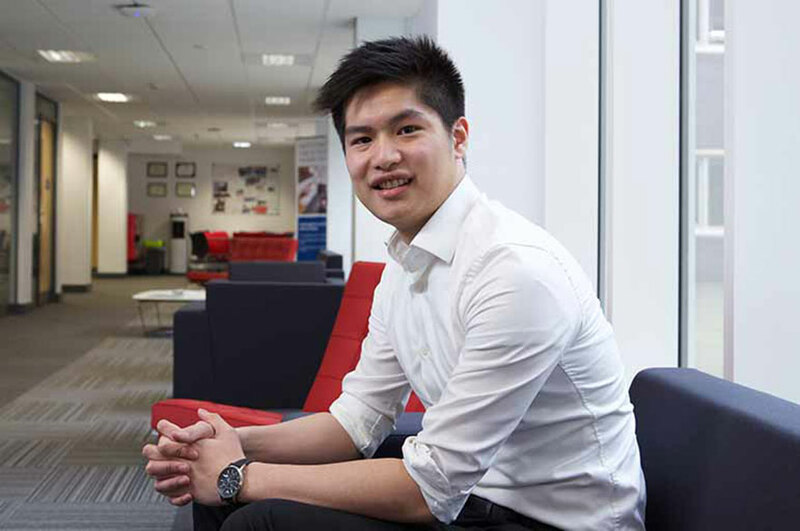 "At NTU, there is an emphasis on work experience and practical skills. This idea is incorporated in the extra-curriculum activities offered at the University. Students can moot competitively or start up entrepreneurial projects with Enactus at The Hive. I enhanced my CV by taking a year in industry, so there are many opportunities to make you a well-rounded individual. Read about Anthony's placement year at Bhatia Best Solicitors, a Criminal Law firm. "The student support is very good at NTU, especially the careers advice department for the Law School. It has a dedicated team who can guide you throughout your goal of gaining a career in the legal sector. "The University has many areas where you can just relax. Recently the Students' Union was built and there are so many areas where you can talk about your day. You can talk to your peers in the Café or grab lunch at the bar after an early morning. Nottingham Law School is based in the City site, so there are many other options opened to us during lunch. "In the library there are plenty of spaces to work independently or as a group. As a final year student, I feel that the library is comfortable and well equipped enough for me to spend long hours preparing my seminars and dissertation. "I have grown so much during my time at Nottingham Trent University. I joined many societies from Debating to Enactus and was fortunate enough to join many committees within the University. This developed my professional skills substantially as I was able to work with senior management within the institutions, as well as with my fellow students who also strive to push their boundaries. "I was born in Nottingham and have lived here since, so Nottingham was always going to be home to me. Nottingham is a growing city and every year more and more students come to its universities. There are numerous bars and clubs to accommodate the stereotypical student life. This is balanced by the Creative Quarter in Hockley which has many unique cafés for the coffee and tea lovers. "After I finish my degree I plan to enrol onto the Bar Professional Training Course at Nottingham Law School. As an aspiring barrister I really appreciate the opportunity to speak and present my case in the mock courtrooms. When I gain qualified status, I plan to practise in Land Law and Immigration Law."